I have been busy giving guest lectures to start off the semester, and my two favorite were when I got to talk to a Writing 2 class regarding One Step For Animals (in order to give them some potential research topics). I distributed 1S booklets to each student in the two classes. 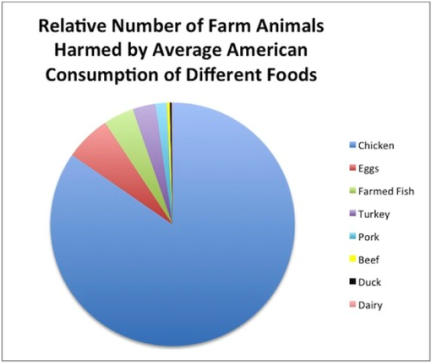 My presentation consisted of a basic introduction, showing the One Step Matters video, then elaborating further showing the two graphs regarding farmed animals. I made a point of always coming back to animals, specifically chickens. I asked the class: How many chickens are in a bucket of chicken? How many buckets of chicken do you think people consume? I also noted the cost of chicken per pound and cited Chipotle's pricing for meats - chicken is $0.50 cheaper than Steak and Carnitas. I mentioned how One Step is different from other organizations based on our decades of experience and learning from our mistakes while using current data regarding consumption trends and studies on effective advocacy to hone in on what is conceivably the best approach to reduce animal suffering. I also made certain to not alienate anyone or make it seem like the talk was about me, even though I had to talk a bit about myself and share my Steps in getting here. We know that people like stories, so this helped maintain attention. I did speak briefly on health and well-being by sharing my story because it added some humor. When I was 16 and seeking more information about vegetarian health and nutrition, my then-doctor basically lied to me. I told them not to be misled by any claims of inferiority or superiority regarding meatless diets. Always track the source! I got some great questions and feedback, one regarding One Step's overall goal - reduce suffering or stop the slaughter? I told the student that we would all like to see the slaughter stop. But we know that nothing, including civilizations, changes overnight. So we want to reduce suffering now. If the slaughter stops 100 years from now, at least fewer animals suffered in that time, rather than more animals suffering while waiting for liberation to occur. We especially don't want more animals to suffer when people could have easily taken practical steps, such as excluding chickens from their diet. It may not seem like a great deal for the cows, pigs, and sheep, but let's remember how many chickens it takes to fill a bucket of chicken - how many wings, how many breasts, how many thighs/legs? I also got a question about laws to protect animals to which I asked the class, Who drives over the speed limit? Do you always get pulled over when you speed? I mentioned there is some strength in recognition by laws, but the lack and futility of enforcement weakens the laws. I referenced undercover videos of factory farms to illustrate that the industry is not scared of breaking laws. And since politics changes, we cannot rely upon laws completely. I had a couple students tell me after the presentation that they were not aware of all of this and that they were very impressed with the One Step approach. One student told me that the estimated 24 chickens per year is probably too conservative based on how many chickens he thinks is in a bucket of chicken and how much chicken that he and his family and friends consumes. He said he is going to seriously attempt to eliminate chicken from his diet, acknowledging the data provided by One Step and the overall arguments for reducing animal suffering. He said he also likes the format of the booklet - it is not wordy, it visually appealing, the message is clear and well-received, including great recommendations for how to take One Step.